Peter Venables died peacefully in York Hospital on 26 April 2017 at the age of 94. Peter was a most remarkable scientist. His career spanned the entire development of modern Psychology, spawning landmark contributions to the fields of schizophrenia and psychophysiology, encapsulated in three citation classics and over 260 research papers. In the light of his exceptional achievements, one of the more striking aspects of Peter’s life was how he accomplished so much based on a relatively modest background. He was born in Ilfracombe where his father was a shop-keeper, but he largely grew up in West Kirby, a small town close to Liverpool. While he always wanted to attend university he could not commandeer the support of his parents. He consequently left school at the age of 16 to work as a telephone engineer before serving in the navy in World War II as a radar technician on ships. Surprisingly, these early experiences were to sow the seeds for him becoming an internationally-renowned psychologist. How Peter became interested in Psychology has always been a bit of a mystery, even to Peter himself. He clearly had a penchant for Physics and Electrical Engineering, so these would be clear candidates for study. However, his thinking was that having been out of school so long, he would be at a disadvantage compared to other applicants in these fields. More importantly even when he was in the navy he envisaged a parallel between the technological aspects of his work on radar equipment and telephones, and the mechanics of the human mind. Remarkably, that insight led him to subscribe to the British Journal of Psychology when he was in the navy, and even to become an “attached” member of the BPS. That action was prescient. Ultimately it was to lead to him become President of the BPS in 1980 and to receive the Society’s Lifetime Achievement Award in 2015. 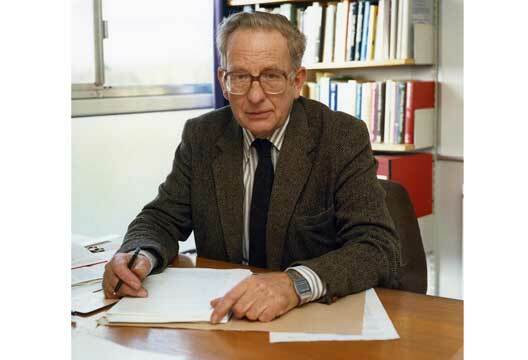 In 1974 Peter founded the Department of Psychology at the University of York, where he quickly established the principles that still determine the ethos of the department: that psychology is most influential when it is quantitative, biological, and experimental. Peter, the visionary that he was, clearly saw that the future of Psychology lay in technology, and that information technology and physiology were going to be critical drivers of progress. With these firmly on his radar, he hired technically-accomplished academics, and built the department from origins in animal and human psychophysiology to human neuroimaging. Peter saw human neuroscience coming before many others, a legacy of his early life experience as a post-office engineer and navy radar technician. In addition to his passion for photography, Peter adored gardening, and kept a magnificent garden in his cottage in the countryside outside of York. That enthusiasm was long-standing, having begun as a young boy when he was given a part of his parent’s garden to grow things, with the full run of the garden shed. His garden was radiant, and sparkled with as much light and colour as Peter’s intellect lit up the academic landscape. Right up to the time of his death at the venerable age of 94, the love of gardening never left him. We remember Peter with great admiration. He was a man of immense integrity, a good deal of dignity, and at least a little genius. He was publishing scientific articles right up to the time of his death, his last one being on sleep. Despite his passing, his legacy lives on in the Department of Psychology at the University of York, in his two sons – Andrew and Peter – and in his many grandchildren. - See also our 'One on One'. Peter Venables was a remarkable scientist who had a career that spanned the entire development of modern Psychology. He made landmark lifetime contributions to the fields of schizophrenia and psychophysiology, encapsulated in three citation classics and over 260 research papers. He was a Past-President of the BPS, of the Society for Psychophysiological Research, and of the Experimental Psychology Society. He was a world-leading authority whose scientific vision has inspired research for more than half a century. Peter Venables received his BA in Psychology from University College London (1951) and his PhD from the Institute of Psychiatry (1953). After three years as a Reader in the Department of Psychology at Birkbeck College, he was given a Personal Chair in the same institution. He was further appointed as Dean of the Faculty of Science at Birkbeck (1968-1970). In 1974 he was appointed to the Foundation Chair in the Department of Psychology at the University of York, where he was appointed Pro‑Vice-Chancellor in 1981. He “retired” in 1988 to become Emeritus Professor of Psychology at the University of York. Peter began his research career in 1951, and 66 years later he was remarkably still active in the field (e.g. Venables & Raine, 2016; Raine & Venables, 2017). He was a leading figure in establishing the field of experimental psychophysiology, playing a key role in setting up this discipline in Britain throughout the 1950s and 1960s. His work was innovative at the time, emphasizing an experimental psychological rather than clinical approach to understanding schizophrenia. In 1974 he founded the Department of Psychology at the University of York, where he established the principles that still underpin what has become one of the UK's most successful departments. Honours for his major contributions to research on both sides of the Atlantic include an honorary D.Sc. from Bradford University (U.K., 1978), President of the Experimental Psychology Society (U.K., 1968-1970), President of the British Psychological Society (1979-1980), President of the Society for Psychophysiological Research (U.S., 1977-1978), recipient of the Award for Distinguished Contributions to Psychophysiology (U.S., Society for Psychophysiological Research, 1987), recipient of the Zubin Award for Distinguished Contributions to the Discipline from the Society for Research in Psychopathology (U.S., 1990), Honorary Member of the Experimental Psychology Society (U.K., 1993), an award from the British Association for Cognitive Neuroscience for Outstanding Contributions to British Psychophysiology (UK, 2009), and most recently the Lifetime Achievement Award for Distinguished Contributions to Psychological Knowledge (British Psychological Society, 2014). Peter published over 260 journal articles, book chapters, and books. Three of his articles have been recognized as citation classics. His contributions in the fields of schizophrenia and psychophysiology cover the five domains of enquiry that are outlined below - clinical, cognitive, neuroanatomical, psychophysiological, and neurodevelopmental. Peter first began to study schizophrenia in 1953. His first citation classic in 1962 (“Level of arousal and the sub-classification of schizophrenia” published in Archives of General Psychiatry, now JAMA Psychiatry, Venables and Wing, 1962) has been influential at multiple conceptual levels and illustrates a theme that has been reiterated for several decades. He argued that there were essentially two types of schizophrenics: those who showed “active” behavior on the hospital ward and those who were “withdrawn”. He went on to demonstrate that these two groups differed in terms of physiological arousal. This landmark contribution became the forerunner of the positive-negative symptomatology distinction in schizophrenia which became immensely influential in the 1980s and 1990s. Peter also made major contributions to research in schizotypal personality. He developed a scale for the assessment of schizotypal personality in the general population which incorporates both positive and negative features (Venables et al. 1990; Venables & Raine, 2015). In terms of mechanisms underlying the development of schizotypy, he also demonstrated prospective links between schizotypal personality and: (i) electrodermal orienting abnormalities (Venables, 1995), (ii) flu exposure during gestation (Venables, 1996), and (iii) cold exposure during gestation (Venables, 1996). His most striking and innovative contribution in this area came in 2012 when he documented for the first time that early malnutrition at age 3 predisposed to schizotypal personality 20 years later in adulthood, and that cognitive dysfunction in later childhood mediated this relationship (Venables & Raine, 2012). This work was featured on the front cover of American Journal of Psychiatry, the leading journal in the field. The significance lies not just in the scholarly contribution it made to understanding the mechanisms underlying schizotypal personality, but also the fact that this leading first-authored publication was made at the age of 89, a contribution made possible by his continued analysis and longitudinal study of the data he collected in Mauritius. Amongst a wealth of influential papers, it is widely recognized that Peter’s most original, influential, and seminal work was his paper on “Input dysfunction in schizophrenia”, first published in 1964, which built on his earlier work on selective attention, withdrawal, and cortical activation (Venables, 1963). Recognized by ISI (now Web of Science) as a citation classic, this theoretical paper became critically important in shaping the field of schizophrenia research because it was the first to clearly articulate the view that schizophrenia can be viewed as a disorder of attention and arousal that manifests itself differently in different sub-types of schizophrenics (Venables, 1964). His linkage of over-arousal with a narrowed range of attention, and under-arousal with a broadened attention span, set the stage for a whole new cognitive approach to understanding the causes of schizophrenia which was based on fundamental neurophysiological abnormalities. It was the first paper to use information processing theory as a basis for understanding disordered mechanisms in schizophrenia, and went on to stimulate a formidable body of empirical work testing his theoretical formulations. A hallmark of Peter’s work was the way in which it integrated cognition, psychophysiology, and neuroanatomical perspectives to understand schizophrenia. Building on the idea of electrodermal responding-nonresponding (Venables, 1971), his was the first laboratory to demonstrate that schizophrenics fall into distinct sub-groups of electrodermal non-responders and electrodermal hyper-responders (Gruzelier and Venables, 1972). He integrated this finding with animal lesion work to argue that these two biological substrata for schizophrenia have their basis in lesions to the amygdala (producing hypo-responding) and lesions to the hippocampus (producing hyper-responding). This principle of linking neurophysiological and neuroanatomical deficits has since been developed further in the context of brain imaging research on the disruption to neural networks in the brains of schizophrenia patients and how they can help explain the pattern of cognitive deficits and symptomatology that are found in this disorder. Peter was internationally recognized as one of the world’s leading authorities on psychophysiology. His text on methodological issues in psychophysiology became the benchmark for all future methodological research in this field (Venables & Martin, 1967). In particular, he developed an international reputation throughout the 1960s for his experimental research on mechanisms underlying skin conductance activity, and also for work on the psychophysiological correlates of schizophrenia. His third citation classic (Lykken & Venables, 1971) on direct measurement of skin conductance set another important standard for the field. The application of psychophysiological techniques to understanding schizophrenia was a hallmark of Peter’s early career at a time when biological contributions to psychopathology were much less appreciated than today. Parenthetically, Peter was a founding editor of the journal Biological Psychology in 1977, illustrating his prescient understanding of the importance of a neurobiological approach to understanding human behavior. Peter’s many psychophysiological contributions extend into health research. He documented that flu exposure during pregnancy not only influences schizotypal personality, but also skin conductance activity (Venables, 1998). This health-psychopathology interface is an area he continues to work on. More broadly, his contributions to the field of psychophysiology are most clearly reflected in his being the first non-US scientist to be elected to Presidency of the Society for Psychophysiological Research (U.S., 1977-1978), as well as his being recipient of the Award for Distinguished Contributions to Psychophysiology (U.S., 1987). In 1972, in conjunction with Sarnoff Mednick and Fini Schulsinger, Peter set up the Mauritius Joint Child Health study (Venables, 1978; Venables et al. 1978). This prospective longitudinal study involved the collection of psychophysiological, psychological, social, and medical data on 1,795 three-year-old children and is probably the most extensive prospective psychophysiological study of mental health in the world. There are four features of the study that exemplify a neurodevelopmental perspective. Firstly, the study emphasizes the importance of taking a prospective, longitudinal approach to understanding schizophrenia and schizotypy (Venables et al. 1978). Secondly, he documented that influenza exposure predisposes to delivery complications, a finding with implications for the development of schizophrenia (Venables et al. 2007). Thirdly, by dividing participants into electrodermal responders and non-responders in 1972, he was one of the first to clearly articulate the biological high risk approach to schizophrenia research whereby biologically deviant groups are identified at an early age, with the dependent variable being outcome for later schizophrenia (Venables, 1978; Venables et al. 1978). Fourthly, he set up an experimental early environmental enrichment from ages 3-5 years that included better nutrition and which was shown to enhance brain functioning at age 11, and reduce both schizotypal personality at age 23 years. Taken together, these findings highlight the importance of taking a developmental approach to understanding schizotypal personality which today has significant implications for understanding and preventing schizophrenia. Peter Venables was a Fellow of the BPS and was the last surviving member of the first BPS Council formed after it was granted a Royal Charter more than 50 years ago. He served the Society as Treasurer (1963-1965), Deputy-President (1965-1966), and President (1979-1980). In 2015, he received the Society’s Lifetime Achievement Award. Peter Venables was a scientist of distinction and an outstanding leader among psychologists. His life and work, in both their breadth and depth, are an inspiration to us all. Gruzelier, J.H. & Venables, P.H. (1972). Skin conductance orienting activity in a heterogeneous sample of schizophrenics. Journal of Nervous and Mental Disease, 155, 277‑287. Raine, A. & Venables, P.H. (2017). Adolescent daytime sleepiness as a risk factor for adult crime. Journal of Child Psychology and Psychiatry and Allied Disciplines, doi:10.1111/jcpp.12693. Venables, P.H. (1964). Input dysfunction in schizophrenia. In Maher, B. (ed. ), Progress in experimental personality research. Academic press: New York, 1964, 1‑41. Venables, P.H. (1978). Psychophysiology and psychometrics. Psychophysiology, 15, 302‑315. Venables, P.H. (1998) Maternal exposure to influenza in pregnancy and electrodermal activity in offspring: A further study from Mauritius. Psychophysiology, 35, 438-442 8. Venables, P.H., Liu, J, Raine, A., & Mednick, S.A. (2007) Prenatal influenza exposure and delivery complications: implications for the development of schizophrenia. Family and Community Health, 30, 151-159. Venables, P.H., Mednick, S.A., Schulsinger, F., Raman, A.C. & Bell, B. (1978). Screening for risk of mental illness. In Serban, G. (ed. ), Cognitive defects in the development of mental illness. Brunner/Mazel: New York, 1978. Venables, P.H. & Raine, A (2012) Poor nutrition at age 3 and schizotypal personality at age 23: the mediating role of age 11 cognitive functioning. American Journal of Psychiatry, 169, 822-830. Venables, P.H. & Raine, A (2016) The impact of malnutrition on intelligence at 3 and 11 years of age: the mediating role of temperament. Developmental Psychology, 52, 205-220. Venables, P.H. & Rector, N.A. (2000). The content and structure of schizotypy: A study using confirmatory factor analysis. Schizophrenia Bulletin, 26, 587-602. Venables, P.H., Wilkins, S., Mitchell, D.A., Raine, A. & Bailes, K. (1990). A scale for the measurement of schizotypy. Personality and Individual Differences, 11, 481‑495. Venables, P.H. & Wing, J.K. (1962). Level of arousal and the sub‑classification of schizophrenia. Archives of General Psychiatry, 7, 114‑119.